Big Questions In Science- 8) Why do continents exist only on planet Earth? Geologists agree that the continental crust formed when magma melted in the Earth’s mantle, erupting to the surface. 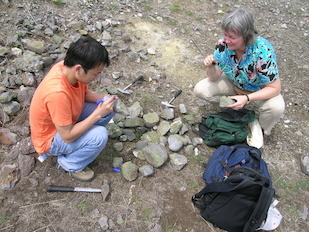 “The perplexing thing is that the continental crust is comprised of rocks that could not have come directly from the Earth’s mantle,” says Rudnick, “so other processes must have been involved.” The crust has an andesitic bulk composition, while geologists would expect it to have a basaltic composition, like the Earth’s oceanic crust and terrestrial areas on Mars and Venus. This “Crust Composition Conundrum” puzzles Rudnick, and she has traveled the globe for answers. Her research currently takes her to Eastern China, where she looks for clues in rock samples brought to the surface through volcanic eruptions—what Rudnick calls a poor man’s drill hole. “We would love to drill down and collect samples, but it’s hugely expensive, and is not feasible past 12 kilometers,” says Rudnick, who explains that the base of the crust is 40 kilometers deep and the underlying lithosphere is 150 kilometers below the Earth’s surface. Back in the campus geochemical laboratories, her research team has analyzed the samples extensively, finding evidence to explain the conundrum. One theory, called “recycling of the lower crust,” posits that millions of years ago the crust was basaltic, but that over time the denser minerals, containing iron and magnesium, accumulated in the lower crust and eventually sank into the mantle. Her lab also unearthed evidence that chemical weathering has changed the crust composition over the ages by removing soluble elements, such as magnesium.